All Over The Decorating Spectrum…. As I have mentioned before and on my makeover posts, I have a somewhat eclectic style home decor. During my early twenties I fell in love with the shabby chic/cottage style (while mixing in with country – the good ‘ole time style), my thirties the traditional style, my forties – I would almost say Tuscan to eclectic style and now that I have discovered the fifties – the eclectic farmhouse/scandinavian /classic black and white. Wow – that is what I call “all over the decorating spectrum”…. I recently posted how much I am learning to love black and white, and the more I research additional decorating ideas for our kitchen, the more I am loving the Scandinavian style – the use of natural elements, clean lines and simple design to go along with black and white. For years I used to think every wall, table, blank space, nook and cranny should be decorated!! After dusting all that intricately detailed “what-not” collection, patching nail holes from all those wall hangings, tripping over too much furniture, packing and unpacking multiple boxes for seasonal decor….I am beginning to enjoy the concept “less is more”. I love the airy, openness, light filled, breeze flowing feel. The stuffy, bulging, uncomfortable, can’t breath feeling is becoming a thing of my past. I still have some purging to do and giving up some of the decor bulge…..Until I do, here are a few of my favorite and what I consider Scandinavian decorated rooms…. 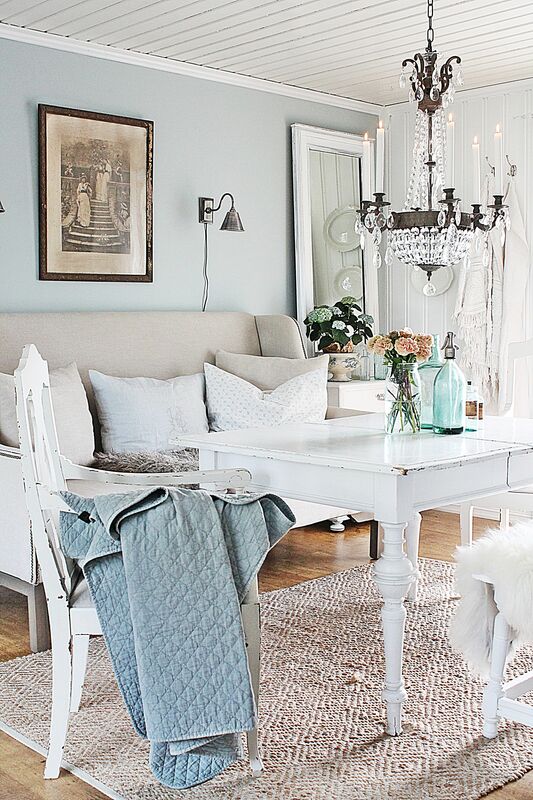 I follow Vibeke’s Pinterest and blog – her decor is stunning, breathtaking. 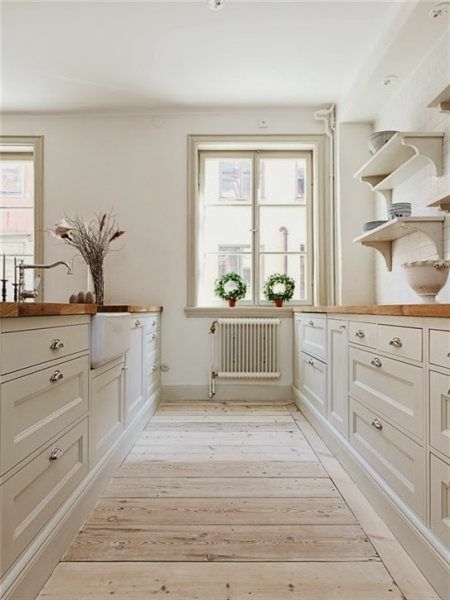 My Scandinavian Home is another exquisite decorating blog I follow. After looking back at these images I guess you could say that I still have a little of the shabby chic, some classic black and white and always eclectic styles in me. What thrills me the most is our kitchen is still in rough form – lower cabinets installed, pantry / fridge built in almost complete, floors are done. The butcher block counter tops, upper cabinets, open shelves and hardware are waiting for installation – I am starting with a clean slate and really get to use these decor ideals! Have a wonderful and blessed evening. May 10, 2017 in Home Decor. I am the pack every nook with something type of person, but looking at your photos is like a relief for the eyes. Very nice lines and muted tones. Very nice, indeed.